Yes, this is another lovely item courtesy the Weardrobe Conference -- the "Popular Revolution" shirt from Cheap Monday, with you guessed it, Mickey's four fingered hand, (er, paw)? It really makes you want to pump a fist in the air and stick it to the man, doesn't it? Or maybe just watch the Disney channel. If I had a TV in this office, perhaps it would be the latter. This skirt number is also from the infamous New York trip. Picked it up at Buffalo Exchange for only $16. I've been hunting for a sequin mini for awhile now and just love how it adds a little bit of flavor to a regular jean jacket/skirt ensemble. And if I just add a black tube top and carry a tray around, I have my cocktail waitress outfit for Halloween all set. Just kidding guys. I'm actually going to be a Reno gambler, fanny pack and all. How's that for classy, eh? Kristal...how are you?? ?...Your look are fantastic!!! I love my Mickey shirt so much! I wish I could rock sequins like you do, girrrl! So fun. Love the skirt! You make sequins look so wearable! 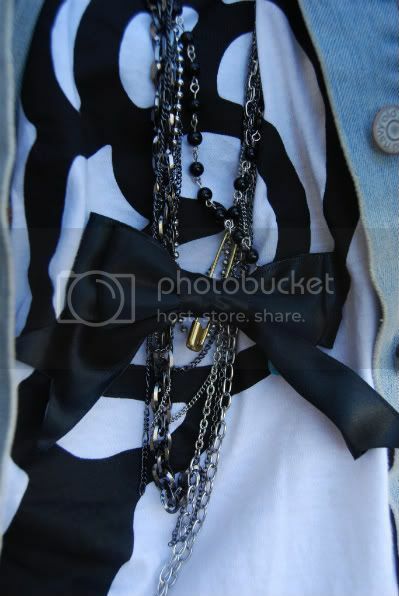 Love it paired with the denim jacket. Perfect everyday look! ha so cool! you and "whatiwore" wore the same shirt in your posts today. I'm so glad you all had fun. Would love to have been there! I can't believe your shoes are from Payless. I should get a basic pair myself and deck them out at home - thanks for the tip...! gorgeous, i regret not picking up that jean jacket at old navy recently. might have to run back there! This looks great. I love the details! love the skirt! i've got one from f21 coming in the mail..afraid it's gonna be a little *too* mini, though. That one is the perfect length! 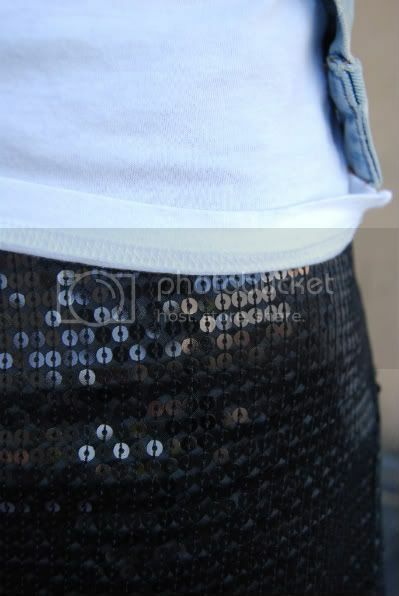 I love your sequin skirt! I want one for the fall too. OO! love this skirt. been thinking about getting some sequin leggings...not sure i am ready for that though. I adore this look! The skirt is freakin awesome.